The wrists break, or hinge, in two ways in the golf swing. Put your palms together with your fingers pointing away from you. Now hinge your wrists so your thumbs point back toward you. This is vertical hinging, which every golfer does. Set up your hands like you did before and this time hinge your wrists from side to side. This is horizontal hinging, which fewer golfers do. 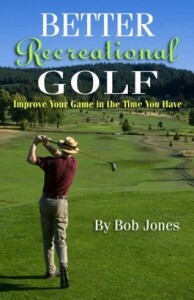 The complete golf swing must include both types of hinging. Vertical hinging takes care of itself. That’s why every golfer does it. Horizontal hinging must be deliberately done. When you take the club back, and your hands get to about hip height or a bit before that, start bending the right wrist (left wrist for left-handed golfers) back on itself. Don’t do it all at once, and finish the hinging by the end of the backswing in a position that is comfortable. You will feel the bend, but it should not feel forced. When you begin the forward swing, preserve your gain. Keep that wrist hinge as you start down. Let the momentum of the swing release all hinging as the club swings into the ball. This is one way of generating club head speed. It’s free, you don’t have to force it. Just enjoy it. For another view of wrists in the swing I refer you to Ike Handy who wrote two books in the ’60’s which you may have read. His position is the contact with the ball should be made with hinged wrists and released some time after and rehinged at the completion of the swing. He said this is the only way to consistently hit the ball straight – swing the hands, arms (especially the left arm) and the top of the club, not the club head. In his view, while releasing as you describe increases increases club head speed, most of the power in the swing comes from fast body movement and a slow down swing. I would be interested in your take. Peter, Yes, I have each of them. 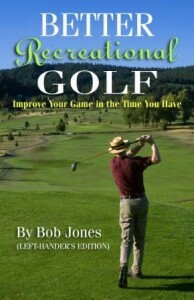 I have read Handy’s book, How to Hit a Golf Ball Straight, more than a few times. What I got from it was that the hands have to be ahead of the clubhead at impact, and that the wrists (actually, just the right wrist) are still bent at impact. This much is true. But there is other stuff where he mistakes opinion for fact and other stuff that he is flat out wrong about. There isn’t space to go into all of it. You mentioned the speed of the swing. 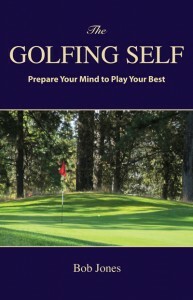 Handy clearly states, several times in the book, the slower you swing, the harder you will hit. Try that sometime and see what you get. In addition, if you have a fast body turn and a slow arm swing, your arms will be so far behind that all you will hit are wicked push slices. See this post on how to get distance. Do that and keep your hands ahead of the clubhead and you can learn to hit the ball both straight and long.